Peaches are showing their sunny faces in the markets at the moment. They are very juicy and full of bright summer flavor. I think this dessert is a great way to salute them. 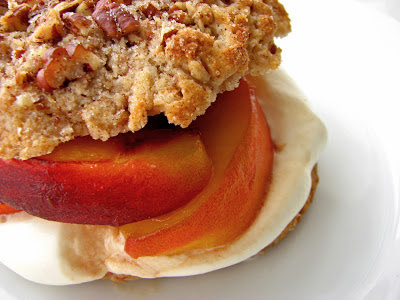 This is a sort of Southern take on shortcake. 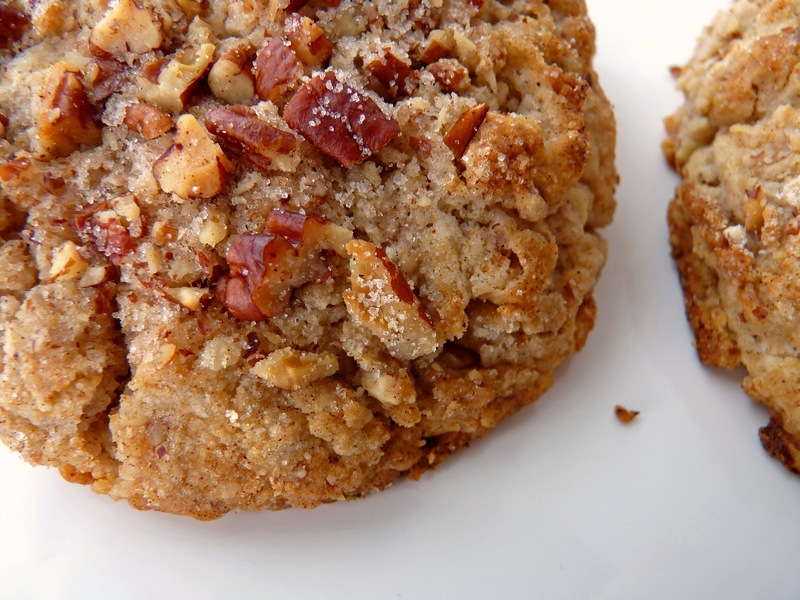 The biscuits are made with ground pecans and cinnamon. This produces a really delicious biscuit with a nice crunchy crust. The peaches are blanketed with brown sugar and a spritz of lemon and left to sit and develop some very delicious caramel-like juices. The cream is flavored with a little splash of brandy that provides the perfect warm note in combination with all the other ingredients. All we need is a cool breeze and a nice veranda to sit together and enjoy every bite. - I used a 2 3/4” cutter for the shortcakes and I got 6 biscuits. You could make smaller ones for tea service. Another way to serve is to make layers of crumbled biscuit, fruit, juices and whipped cream in parfait glasses. - To toast pecans, place them on a baking sheet and toast in a 350 degree oven for about 10 minutes. Be careful not to overdo it or they will taste bitter. They should brown slightly and give off a lovely toasty fragrance. - Once you add the buttermilk, do your best not to handle the dough too much. It will toughen the finished product. Gently press the dough into a mass, but do not knead it. - The brandy in the whipped cream adds a great subtle note to the whole dessert, but if you don’t wish to use it, substitute 1/2 teaspoon of vanilla extract. You can also add a pinch of cinnamon. - There’s a lot of sugar on the peaches because you will want lots of the juices to spoon over the fruit. - These would be really, really good with fresh fig slices steeped in a mixture of honey and a bit of water and cinnamon or apples or pears sauteed with brown sugar and cinnamon. 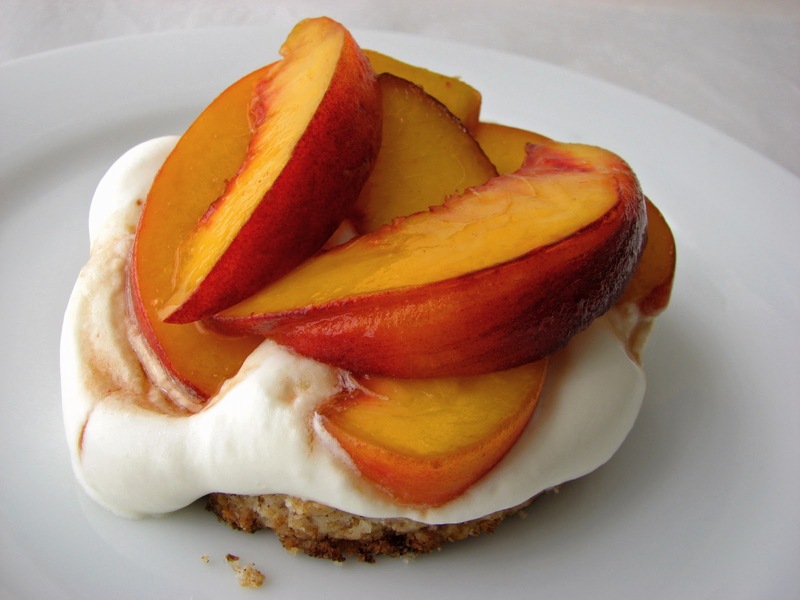 Cut peaches in half and remove pits. Slice them thinly and toss with lemon juice and brown sugar. Set aside to macerate, stirring every now and then to distribute the juices. Preheat the oven to 425°. Prepare a baking sheet with parchment. Finely chop 1/3 cup of the toasted pecans and toss with 2 tablespoons of sugar and a good pinch of cinnamon. Set aside. Melt 1 tablespoon of butter and set aside. Place the flour, salt, sugar, baking powder, cinnamon and 2/3 cup of the toasted pecans in the bowl of a food processor and process until the pecans are finely ground. Pour the dry mixture into a bowl. Add the butter pieces and toss to coat them. Using your fingers, pinch each piece of butter flat, then into pieces the size of a pea and keep tossing the mixture. You can also use a pastry blender if you prefer. Stop when the mixture looks like coarse meal. Work quickly so the butter stays cold and firm. Add the buttermilk all at once and fold everything together gently with a spatula just until it starts to come together, the mixture is moist and there are no patches of dry flour. Gather the dough and place it on a clean work surface or a piece of parchment and gently pat it together with your hands. Do not knead. Shape it into a round about 3/4” thick. Use a round cutter dipped in flour to cut out the biscuits. Place them on the baking sheet. Brush the tops with melted butter and sprinkle with the pecan cinnamon sugar mixture, pressing down gently to secure the nuts. Bake about 13-15 minutes, until the biscuits are lightly golden. Whip the cream, sugar and brandy to a very soft peak. It should be fairly loose and creamy. Cut the biscuits in half horizontally. 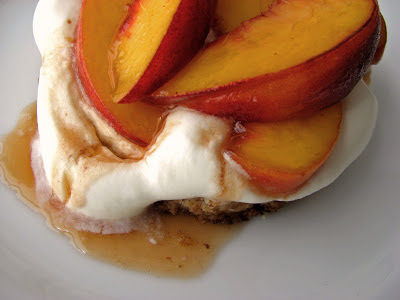 Dollop each half with some whipped cream and then layer on some peaches with plenty of juices. I once tasted a delicious ice cream mysteriously called Lotus Cream at an ice cream shop in San Francisco that is now long gone. It was so good that I kept thinking about its ethereal flavor of lemon and almonds and how light and delicious it tasted. I tried to replicate it at home and my memory was jogged when I recently ran across my old faded notes. Just reading them over once again convinced me I had to make this ice cream to see if it still held its charm. This recipe takes just a few minutes to put together. The flavor is subtle but distinctive and unmistakably fresh. It’s been years since I’ve made it but I was gratified to find that it tastes every bit as delicious as I remember it. 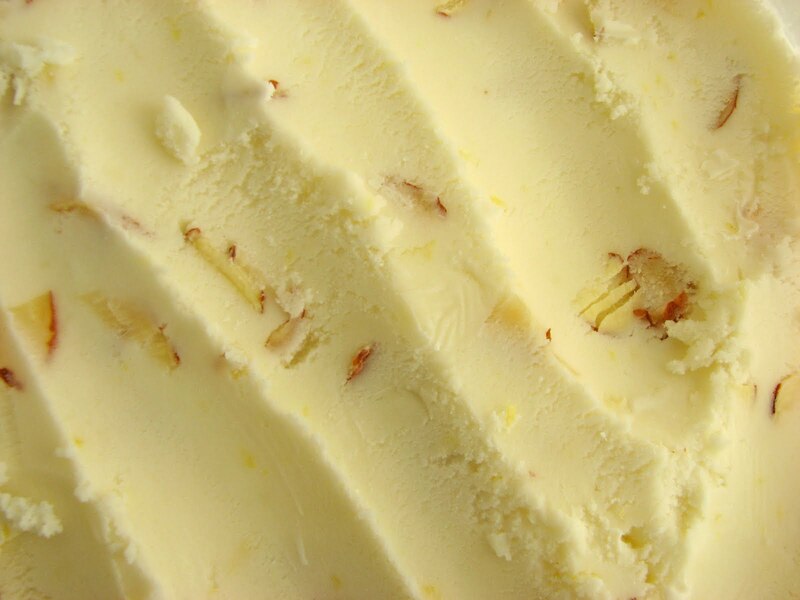 It’s light yet creamy with a brightly tart sensation that finishes with a back note of almond. It has that unmistakable pucker of fresh citrus that lemon fans will enjoy. Simple, refreshing and very, very much in keeping with the fanciful days of summer. - Be sure to use a good quality almond extract. Start with a scant 1/2 teaspoon and taste. Add a drop at a time and taste until you get the right flavor for you. - Always add the salt last and then taste. Then keep adding a few grains at a time and keep tasting. You’ll know when you have the right amount because the flavor will heighten noticeably. Whisk together all the ingredients except the almonds. Refrigerate the mixture overnight to marry the flavors and to chill thoroughly. Toast the sliced almonds in a single layer in a 350 degree oven for about 6 to 8 minutes. Watch them closely as they will burn quickly. Churn the ice cream base in your ice cream machine. Fold in the toasted almonds. Pour into a clean airtight container, press a piece of plastic wrap into the surface, cover and place in your freezer to firm up. Deep, dark purple plums have just waltzed into town. They are tart and juicy and ready for a spin on the dance floor. 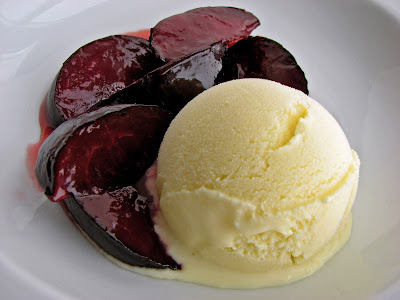 Since ginger is one of my favorite pairings with plums, I couldn’t resist making a simple ice cream to get the party started. 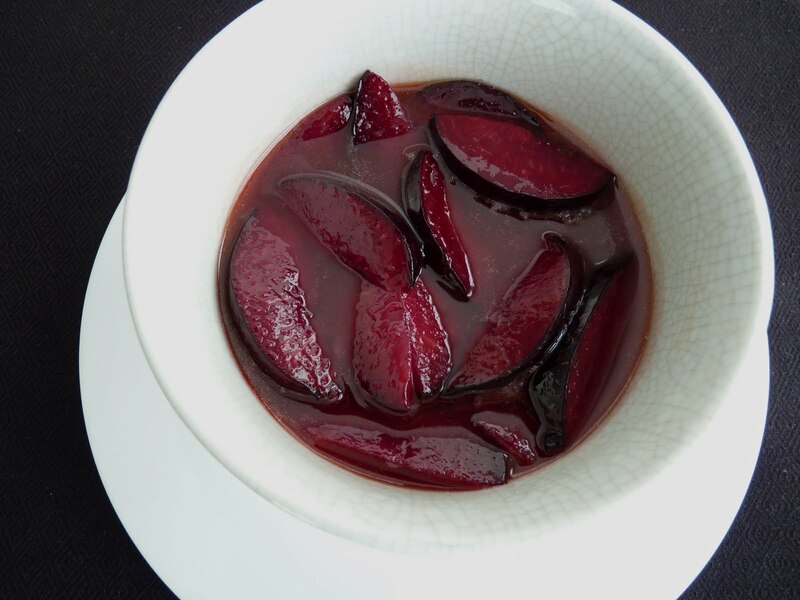 I coat the sliced plums in a caramel that takes on the tartness and color of the fruit. It’s just enough to add a little more interest to both the fruit and the ice cream. For all the true ginger fans out there, this ice cream will give you a gorgeous jolt of pure ginger nirvana. Together, these two components spark a mouthful of delicious sensation from start to finish. I made the ice cream base in about 20 minutes or so and let it sit overnight in the refrigerator to ripen and harmonize. I churned it the next day and let it firm up in the freezer for a few hours. 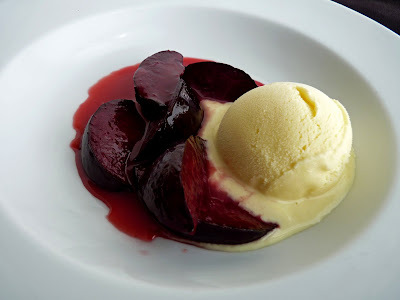 The plums take about 10 – 15 minutes to prepare. Then voila! A super dessert that is both delectable and beautiful on our summer stage. - The 3 oz of fresh ginger will give you a deep ginger flavor with a tiny bit of heat at the finish. The ice cream base is going to taste a bit stronger than the frozen ice cream, so don’t worry if it seems strong. It will mellow out a bit. - I like ice cream that is rich in flavor but light on the palate, so I usually like to use more milk than cream (or equal quantities) and fewer yolks. That will vary somewhat depending on the central flavor of the ice cream but I try to keep the fat content at the margins for a real balance of flavor and mouth feel. If you prefer a richer, creamier version, just shift the ratios to your liking. 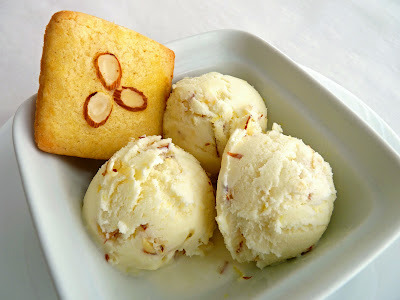 - Whenever I salt ice cream, I usually start with a few grains and then taste. I repeat this process until the flavor really pops. It’s all about individual preference and you’ll know it when you taste it because there is a brightness and clarity that changes the mixture, as though it suddenly comes into focus. 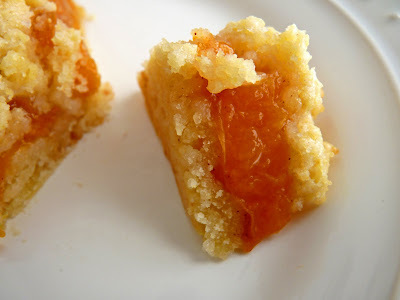 - For another plum and ginger treat, try Plum Ginger Upside Down Cake. 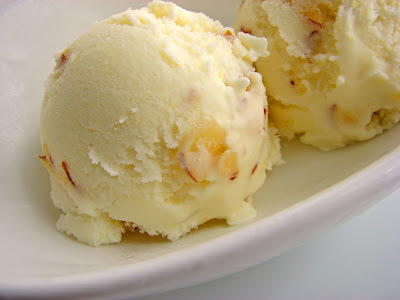 - This Ginger Ice Cream would go well with so many other things: peaches, figs, apples, pears, pineapple, bananas, pumpkin, coconut and yes, chocolate. So any of these in the form of fresh fruits (with or without caramel), pies, crisps, cakes, cookies or sauces would be terrific. To make the ice cream, peel the ginger and remove any dried areas or blemishes. Cut the ginger into thin slices. Place the milk, cream, 1/4 C + 2 tablespoons of sugar and the sliced ginger into a saucepan. Bring to a simmer over medium low heat. Let it simmer for a couple of minutes until the sugar is dissolved. Do not boil. Take off the heat, cover the saucepan and steep for one hour. Strain out the ginger slices and heat again just until warm. Whisk the egg yolks with 2 tablespoons of sugar until the mixture has thickened and is pale yellow. Slowly add the warm cream, whisking constantly to keep the eggs from scrambling. Return the mixture to the saucepan and medium heat. Cook, stirring and constantly and scraping the bottom of the pan until the custard thickens, coats the spatula and a finger traced through it leaves a clean track. Be very careful not to let the mixture heat too quickly or boil. Pour the custard through a strainer into a clean container. Add the vanilla and lemon juice and stir. Add a good pinch of salt to taste. Chill the ice cream base overnight. For the Plums in Caramel, cut the plums into slices and set aside. Combine 1/2 cup sugar and 3 tablespoons of water in a saucepan. Make a caramel by cooking on high heat without stirring until sugar has dissolved and begins to take on a medium amber color. Wash down the sides of the pan with a brush dipped in water if any sugar crystals start to form along the sides of the pan. Slowly tilt the pan back and forth or swirl very gently if the sugar is darkening unevenly in just one spot. Remove from heat as soon as it starts to reach a medium amber color. It will continue to darken for a minute or so after you take it off the heat. Then carefully add the butter, stirring to combine. Add the cream and mix thoroughly. Return to low heat to loosen any clumps. Take off the heat and stir in the vanilla and a little pinch. Add the plum slices and swirl the pan occasionally for about 3 or 4 minutes. Let the mixture cool. 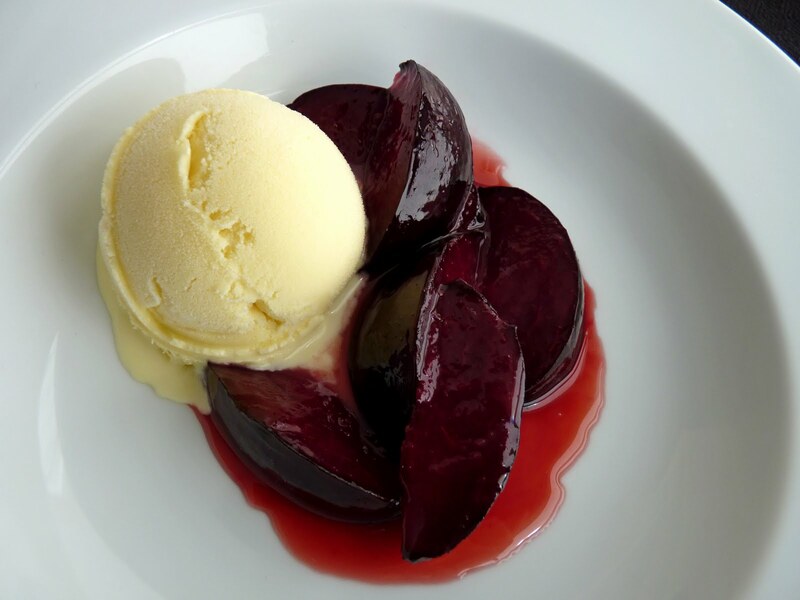 Plate the ice cream and serve with the plums and caramel. There is a sweet and natural affinity between the soft sunset blush of early summer apricots and the homespun State-Fair-Blue-Ribbon pride of corn. Maybe it has something to do with long full days of bright sun, a labor-intensive harvest and our wholehearted ritual of indulging in the season’s bright splash of sumptuous colors and flavors. - I used Quaker yellow cornmeal for this recipe, which is finely ground. 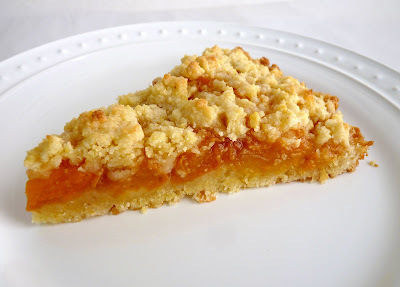 - The method for mixing this dough is the same as for the Apple Crumble Tart. You can see how crumbly the dough should look going into the pan. - Be sure to place the tart on a baking pan lined with parchment to prevent any potential drips from burning on the bottom of the oven. 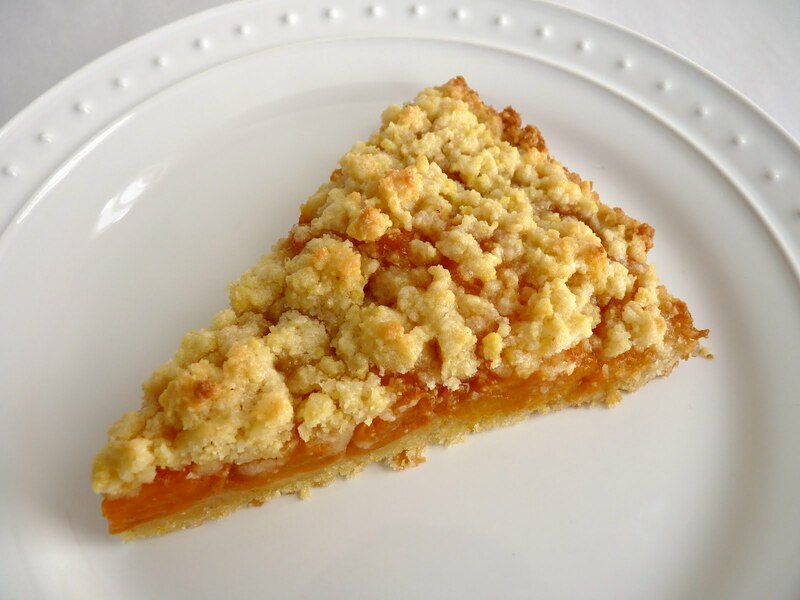 - Another favorite cornmeal and apricot recipe is Cornmeal Cake with Apricots. Cut the apricots in half and remove the pits. Combine the water and sugar together and bring to a simmer. Split and seed the vanilla bean and add to the syrup along with the apricots and the cinnamon. Lower the heat to a low simmer and cook the mixture until the apricots starts to slump and look jammy but still hold their shape. Take off the heat and pour into a strainer placed over a bowl to drain. Set aside to cool. Whisk together the flour, cornmeal, sugar and salt and place in a food processor. Add the butter pieces and pulse just enough to begin to break the butter up into smallish pieces. Mix the yolks and sour cream together and add to the food processor. Pulse just a few times until the mixture looks like it’s coming together but is still rather crumbly. Do not overmix. Pour into a large bowl and toss gently with your hands. Pour about 2/3 of the dough crumbles into a 9” tart pan with the bottom lined with parchment. Gently spread an even layer to the edges and press lightly without compressing it too much. Cover the bottom of the pan completely so there aren’t any holes. Layer the cooled apricots evenly on top, leaving about a little border around the edge. Sprinkle the remaining dough crumble over the top of the apricots. Be sure to spread some out to the edges of the tart pan to form a border. Place the tart on a sheet pan lined with parchment and bake for about 35 minutes. Cool completely before removing from the tart pan to serve. Cherries are now in such great abundance it’s fairly difficult to escape the desire to make that all-American classic, Cherry Pie. Who can possibly resist pie? It's the very next best thing to simply eating fresh cherries right out of the bag. I remember being with friends on our way up the coast in Northern California at this time of year to have a picnic. We stopped at a roadside stand when we scouted a hand-painted sign and saw beautiful big baskets of fresh cherries for sale. We bought a big bag and they were so incredibly good, they were gone before we arrived at our destination. All we had left was a bag of cherry pits and red-stained fingers. 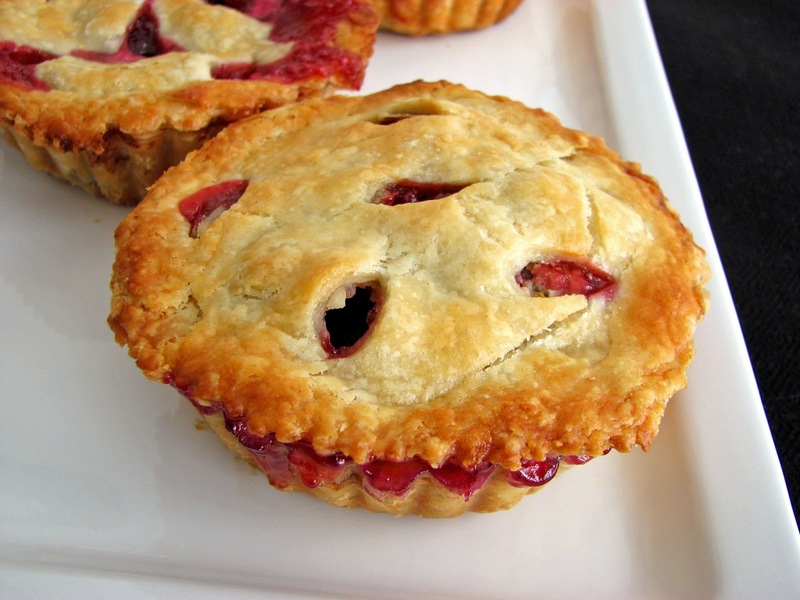 But if you purchase some beautiful fresh red cherries soon and you happen to have any left, consider making some delicious pie. Fresh cherries juice nicely in the baking process, bubbling up just enough to steal your attention. These are individual pies so that pie crust lovers can have more than their fair share of flaky buttery morsels on their plate. You can share your pie if you’re feeling modest, but who knows when the next chance to enjoy fresh homemade cherry pie will come around once again? - The pastry dough is handled very little in order to avoid activating the gluten in the flour, which will toughen the pastry. - I used tartlet pans with removable bottoms that measure 3 3/4” in diameter and are 1 1/4” deep. Use whatever you have that will hold the contents with a good proportion of fruit. - I added an optional Almond Crumble to the mix for flavor and texture. 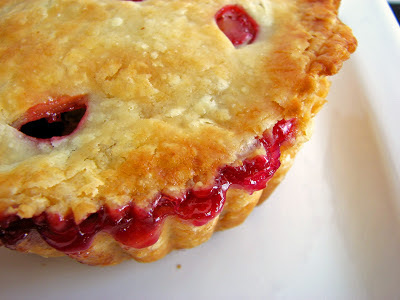 If you decide not to use it, you may want to add an extra couple of tablespoons of sugar to the cherry filling and increase the cornstarch to 2 tablespoons. 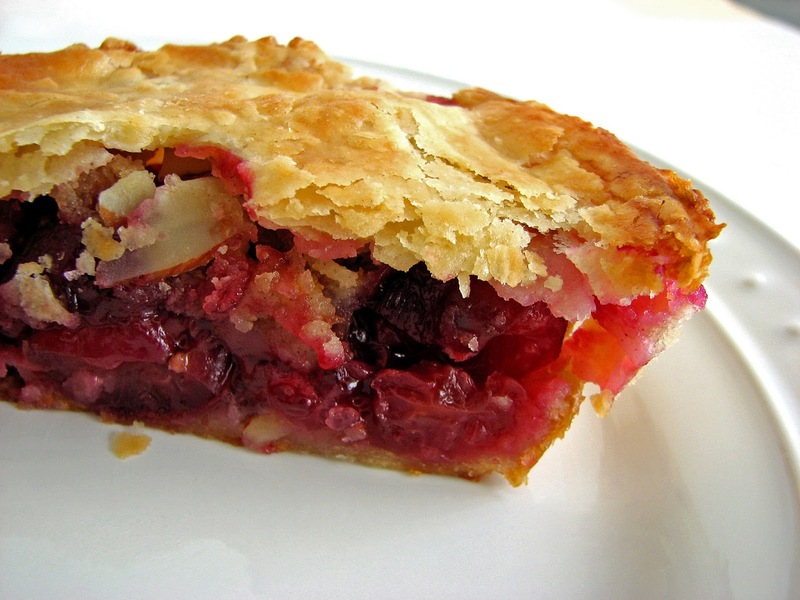 - When you're baking fruit pies be sure the fruit is bubbling vigorously to cook out the cornstarch or flour thickeners. To prepare the pastry dough, whisk together the flour, sugar and salt in a bowl. Add the butter pieces and use your hands to toss together. You want to coat each piece of butter thoroughly with flour as well as your hands. Pinch each piece of butter flat between your fingers, working quickly so as not to warm the butter. Keep tossing the mixture to be sure each piece of butter is coated well with flour. Add the cold water and mix gently with a fork or your fingers until the dough just starts to come together, tossing it lightly until it just starts to loosely cohere. Gather the dough pieces on a clean work surface. Finish the dough by smearing parts of the dough across the work surface with the heel of your hand. Use a bench scraper or metal spatula to get under the smeared dough and gather and fold it back onto itself after each motion. Repeat this process again just a few times until the dough looks like it’s coming together and it feels soft, supple and not sticky. There should be small pieces of butter visible in the dough. Divide the dough into 2 pieces, one with a bit more than the other. The larger piece of dough will be used to line the tartlet pans, the other piece will be used to top the pies. Gently pat each piece into a disc and wrap tightly in plastic. Chill the dough at least 30 minutes. Prepare the Almond Crumble by mixing the flour, sugar, salt, cinnamon, orange zest and almonds together. 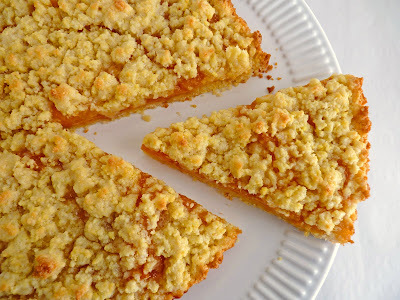 Cut the butter into these ingredients using your fingers or a pastry blender until the mixture looks like a streusel. Set aside. When you are ready to roll out the dough, remove the larger packet from the refrigerator and rest on a lightly floured piece of parchment paper for a few minutes so it can soften just a bit to prevent cracking. Then roll the dough out to about 1/8” thickness, gently lifting and moving the dough after each roll and keeping the parchment lightly floured as needed. Brush off any excess flour. If the dough feels too soft, lift the parchment onto a flat pizza pan or baking sheet and chill again for about 30 minutes. Repeat with the second packet of dough. Take the larger piece of rolled out dough and cut out 6 circles to fit the bottom of your tartlet pans. Line each pan with the dough and trim the edges. Chill while you cut out the tops. Take the second packet of rolled out dough and cut out 6 circles to cover the top of each individual pie. Chill until ready to use. Toss the pitted cherries with the cornstarch, sugar, vanilla and almond extracts and lemon juice. Add the Almond Crumble and toss until everything is evenly distributed. Fill each pastry-lined tart shell with the cherry mixture. Remove the top circles of pastry dough and cut out steam vents on each one. Place one on top of each tartlet, pressing down tightly to seal the edges. Brush the tops of each pie with milk and dust lightly with sugar. 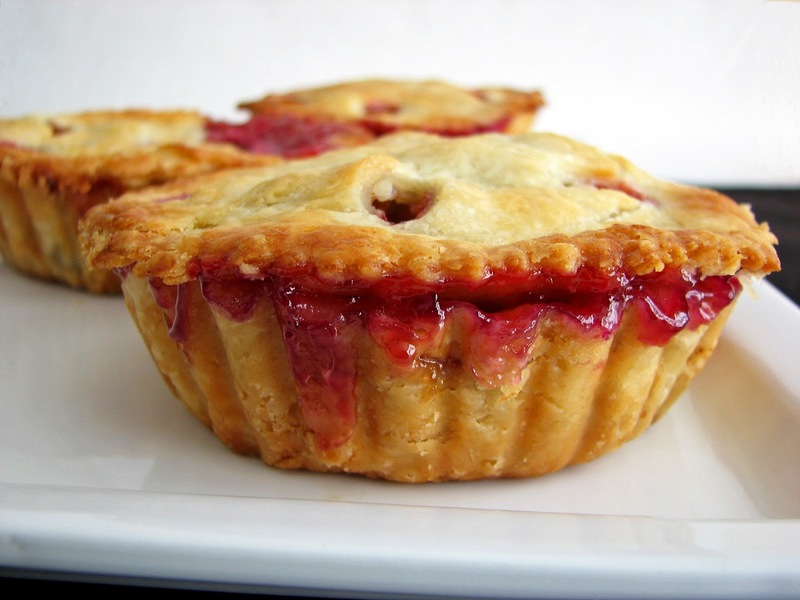 Place the tartlet pans on a baking sheet lined with parchment to catch any juices that might leak. Bake for about 25 – 30 minutes until the crust is golden brown and the juices are bubbling. Cool and remove from pans.